Life is always better when you’re sharing it with your best friend. 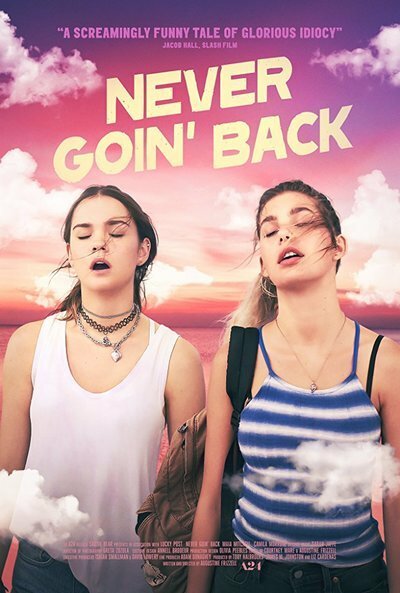 In “Never Goin’ Back,” a raucous comedy written and directed by Augustine Frizell (and yes, country music fans, she is a relation—Lefty Frizell’s granddaughter; she’s also an actor) the best friends share bong hits, poverty, kisses, harder drugs than weed, criminal schemes, self-imposed bowel constriction, and more. We don’t get the backstory of these girls’ unsupervised existence. Angela, for her part, comes off like a grown-to-teenhood version of Brooklynn Prince’s Moonee from 2017’s “The Florida Project.” She’s impetuous, impertinent, and always has a bad idea she wants to put into practice. But neither she nor Jessie are as dumb as any of their male housemates, one of whom is Jessie’s brother Dustin (Joel Allen), whose grand scheme to become a large-scale weed dealer is foiled by a holdup before it even reaches its full form as a fantasy. This is a house full of screw-ups—Jessie and Angela have jobs at a nearby diner mainly because the manager is good-hearted and finds the duo entertaining—and they are!—and the only other resident who’s anything like gainfully employed is the overly scruffy Brandon (Kyle Mooney of “Saturday Night Live”), who’s got a fast food gig. Circumstances, you just know, are going to contrive to deprive the girls of their Galveston dream. And so they do—they get thrown in jail after their own house is robbed, they lose their jobs after accidentally getting blitzed on weed-butter baked goods, and so on. While Angela is the alpha of the duo, the movie never suggests that the viewer should feel that Angela takes advantage of Jessie in spite of the sometimes, um, exploitative nature of her schemes, which grow more desperate as their prospects of getting to Galveston, let alone making the month’s rent, erode. But this celebration of female friendship at its grungiest wants only good things for its heroines, and contrives to get them in the most hilarious ways possible. “Never Goin’ Back” would make a good drive-in movie, if drive-ins were still a thing. It’s breezy, benignly outrageous, equal parts grotty and sweet. There’s not much to it beyond that, but if you’re in a receptive mood, you might agree with me that there doesn’t have to be.